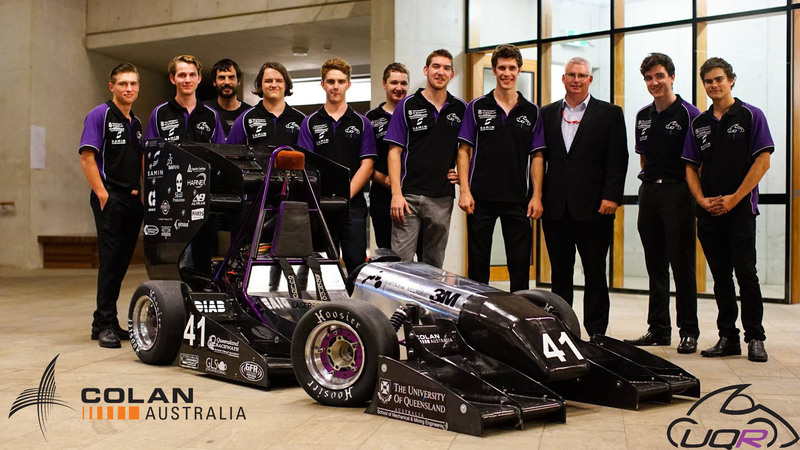 Colan is pleased to congratulate University of Queensland Racing on success in Formula SAE this year. This is a student design competition organized by the Society of Automotive Engineers (SAE). The competition requires student teams to design, develop and fabricate a small Formula-style (open-wheeled and open-cockpit) race car while adhering to a set of general design requirements and regulations. It is important to note that FSAE is not a motorsport competition. The design requirements and regulations are open enough for different teams to develop and implement varying race car design philosophies. This challenges students to think of new and innovative ideas, while ensuring the safety of all competitors. Colan provided materials for the manufacture of the race car. In particular Innegra fibre was used for all of the wing elements for added impact absorption and the fiberglass was used for mould making and design demonstrations. Also, the carbon fibre tape allowed them to make the flanges on the wing elements adjustable. The UQR team were placed 5th overall for the second year in a row. They also came 3rd in engineering design which is the best they have placed in the event in UQR history. This has moved them to 24th position worldwide. Their electric vehicles also placed well with 2nd place out of all the electric vehicles in Australia. They are now placed 67th worldwide.